To enter to the Oxiclean Stain Wheel Contest, a person must be a legal resident of Canada who is age of majority or older. 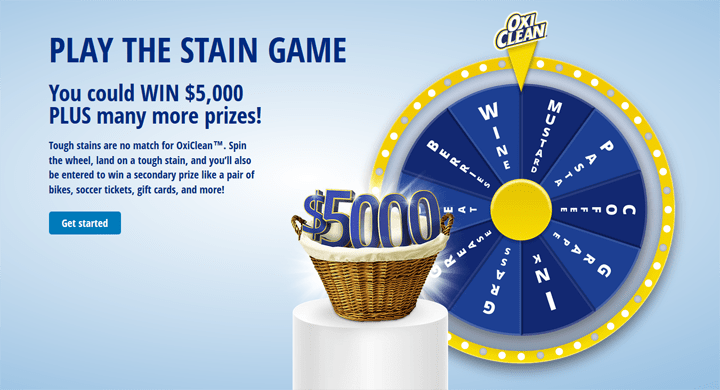 The Oxiclean Stain Wheel Contest ends at 11:59:59 PM ET on November 16. During the period, visit staingame.ca and complete the entry form. Next, click on the “Submit and Play” button to spin the stain wheel. The Wheel will spin and will land on one (1) of ten (10) Wheel Stains. By clicking “Submit and Play”, you will also receive one (1) entry into the Grand Prize Draw. Limit of one (1) entry per person per day. I use Oxi Clean in every load of wash. Love it. Enter for your chance to get up close and personal with some of your favorite Hallmark Channel stars in Graceland! Enter for a chance to win a $2,500 Closet Makeover. Enter for a chance to win a VIP trip to Vail, CO for the GoPro Mountain Games. Enter for a chance to win a Garnet Hill shopping spree! Grand prize winner will receive a $5,000 Garnet Hill gift card.